The subsequent weeks brought no immediate resolution to the conflict over China’s newly declared ADIZ, and 2013 ended with greater attention than ever being directed towards the growing conflict over East Asia’s airspace. Indeed, never before have the reporting obligations of aircraft generated so much public attention, concern, and outrage. Yet, despite the recent media focus on ADIZs, there remains little understanding of just what are ADIZs, or the relevant body of international law that limits the ability of states to interfere with air navigation in non-territorial airspace. 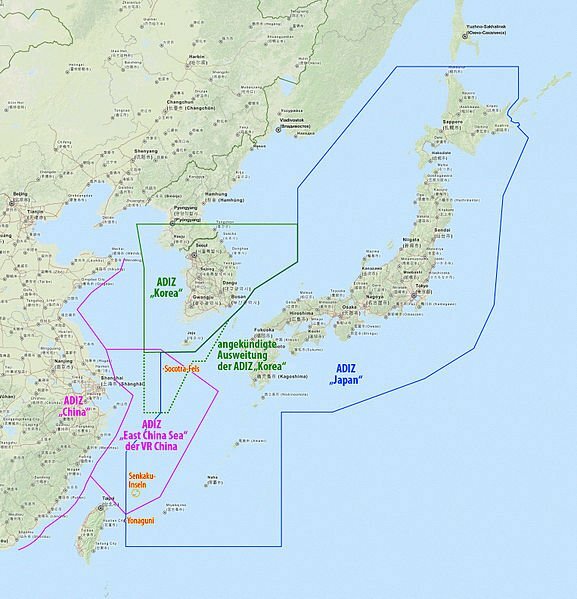 With China arguing its ADIZ is consistent with international law, and existing state practice, and with Japan and the U.S. challenging the new ADIZ, an overview of the law and practice of ADIZs is urgently needed. This contribution aims provide a short introduction to ADIZs and will point out that the conflict over the East China Sea ADIZ is less about reporting and more about growing concerns over the emergent nexus between ADIZs and claims to sovereignty. Xinhua’s description of China’s ADIZ has one feature that stands out, the requirement all aircraft which enter the ADIZ identify themselves, report flight plans and inform ground control of their positions. It is in this respect China’s ADIZ differs from pre-existing ADIZs. Of course, this is more than a simple difference of opinion over reporting obligations. It is important to emphasize that the underlying motive behind Beijing’s November 23rd proclamation of an ADIZ departs from the original intent of Cold War ADIZs, early warning against a strategic air attack on sovereign territory. Indeed, it has been pointed out that for China, “reducing the risk of surprise attack cannot have been part of the equation” when deciding to establish its ADIZ. 19 In fact, Foreign Ministry spokesperson, Qin Gang, linked the ADIZ’s declaration to China’s territorial claim over the Senkaku/Daioyu Islands in a press conference on November 25, 2013. 20 Therefore, the wider reporting obligations imposed by China through its ADIZ underlines the fact China’s ADIZ was not declared out of security necessity, to defend sovereign territory against air attack, but rather it was established so as to demonstrate China’s administrative control over contested airspace. The danger inherent in China’s November 2013 declaration, and reactions to it, are that contestations over sovereignty have entered a new forum in East Asia, that of airspace. With states drawing up unilaterally declared defense identification zones that can extended for hundreds of miles beyond territorial airspace, alongside growing fears that these zones will harden into claims of full sovereignty, a once benign security practice has rapidly evolved into a source of conflict over East Asia’s contested skies.